Known for their use as medicinal plants, tea tree makes a beautiful evergreen specimen in the landscape. The deep green needle-like foliage contrasts perfectly with the large double red waxy flowers of ‘Ruby Glow’. 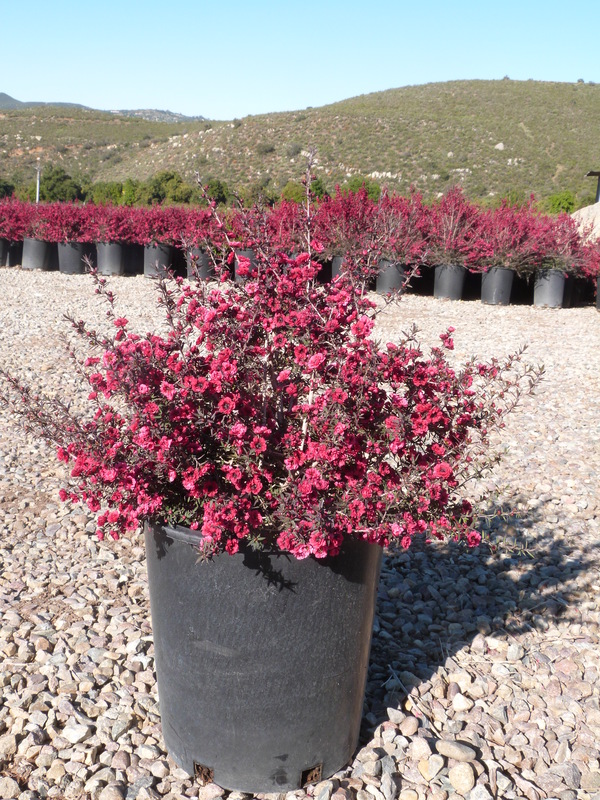 ‘Ruby Glow’ is a tried and true variety and is a favorite of many California gardeners. A New Zealand native, tea tree tends to grow naturally in more acidic soils, peat bogs and coastal regions. Surprisingly though, we’ve found it can adapt to drier climates and soils. However, you’ll find that plants will grow faster and look prettier with supplemental water. If you’re growing tea tree in areas with heavy alkaline soil, you’ll need to amend soil with acidified compost to improve conditions. Plants don’t take well to regular shearing or pruning, so it’s best to allow them to grow into their natural informal habit. Plants can bloom at different times through the year, with most blooms occurring in fall to spring. Tea tree is best grown in morning sun with afternoon shade, as it can scorch in intense sun.